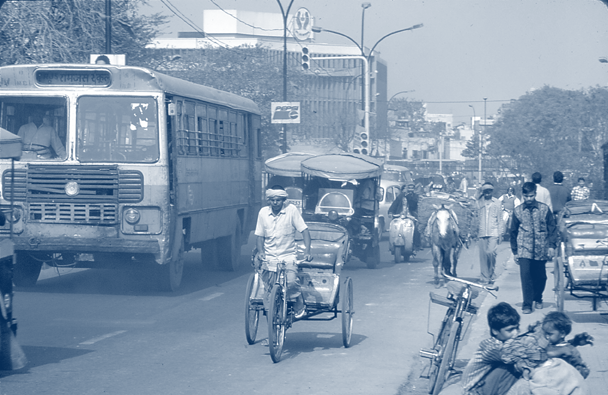 Developing world countries can provide lessons on the do’s and don’ts of transit. Consumer choice is the American way. We have come to expect variety, for example, in our supermarkets. Twenty-five years ago salad lovers were largely stuck with iceberg lettuce; today, however, we find a wide choice of butterhead, romaine, and ruby-leaf lettuces in the vegetable section. Salad consumption is up, and perhaps we’re a little healthier for it. Why do we not enjoy comparable variety and choice in our urban transit sectors? Transit systems can be remarkably versatile. Left to their own devices, they respond and adapt to emerging markets and technologies. In an open and competitive setting, transit operators are keenly aware of the slightest changes in market conditions and accommodate to them. Quick to adjust and eager to make a profit, they deliver what travelers want—a wealth of service options, ranging from motorized three-wheelers to van-size carriers to minibuses, priced at levels the market will bear. The developing world provides a window into the potential benefits (and drawbacks) of a more diverse urban transportation marketplace than what we have in the US. There one finds a kaleidoscope of transit services, marked by vehicles of different sizes, operating speeds, service coverage, seating capacities, and levels of comfort. Fares vary accordingly. 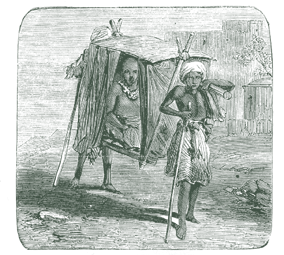 Free-lancers own and operate most of the vehicles, serving populations that are largely poor—many of them very poor. And yet operators are able to earn enough to cover costs and make a living, while charging fares their customers can afford. The rich mix of entrepreneurial services found in the third world evolved spontaneously, without central control or direction. Nobody planned or orchestrated either the sector or the individual operators. Rather, it is largely a product of marketplaces allowed to run their own courses. The hallmark of informal entrepreneurial transit is open competition. Services are designed and priced to satisfy customers. Operators receive no subsidies or capital assistance. Unencumbered by rules and bureaucracy, independent operators are ultra-responsive to emerging and shifting market trends. Typically, hard work and no-frill services keep costs in check. The presence of private carriers alongside public buses and rail systems sets in motion competitive pressures on formal operators. This has happened in numerous Brazilian cities where, prior to clandestino vans, the quality of bus services was slipping at the same time that prices were rising. In the world’s poorest settings, entrepreneurial transit fills the service voids of publicly owned buses and metros. As protected monopolies, government-run bus systems lack incentives to contain costs, operate efficiently, innovate, or respond to shifting market demand. In cities like Jakarta and Lagos, most buses are old, they break down frequently, and they get stuck in traffic. Fares are kept low to help the poor, but lack of revenue precludes service improvements. Public transit finds itself in a free-fall of deteriorating service and falling revenues. It is only because regulations and rules are laxly enforced that unlicensed operators are able to step in “informally” and pick up where public transit operators have left off. In many megacities, informal carriers provide much-needed and much-valued mobility for the poor. They enable tens of thousands of janitors, assembly-line workers, street vendors, and chambermaids to reach their jobs. During night shifts, when buses are no longer running, they sometimes are the only means of getting around. Increasingly, informal carriers are catering to the middle class. In Bangkok and São Paulo, informal commercial vans today vie head-to-head with public buses. Because they offer time savings, air-conditioned rides, and guaranteed seating (in return for premium fares), they are winning the competition. Public bus companies complain, often vehemently, that private carriers are cheaters, poaching customers and creaming the lucrative markets. While these are legitimate charges in some instances, other benefits are often overlooked. For instance, because fewer passengers are served on feeder and distribution routes, the cost per rider tends to be high. Small, private services can aid mainline bus routes by improving connectivity and absorbing high-cost services. And in cities like Nairobi and Phnom Penh, private transit has absolved the public sector from the burden of running bus services altogether, providing the only alternative to walking or bicycling for the vast majority of households without cars. In America and much of the developed world, transit riders typically face one and only one choice—a fixed-route, fixed- schedule, fifty-passenger bus that comes by every thirty minutes. For most of the middle class, this is not an acceptable alternative, so they drive. As America becomes increasingly diverse, so do its mobility needs. 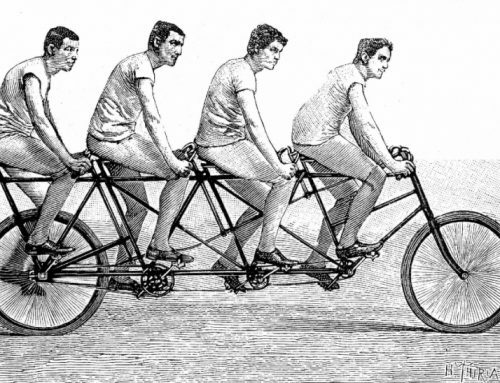 One-size-fits-all transit is an anachronism. The developing world shows just how diverse mass transit can be if free-lancers and micro-enterprises are permitted to select, customize, and operate their own vehicles. Manila is a wonderful case in point. 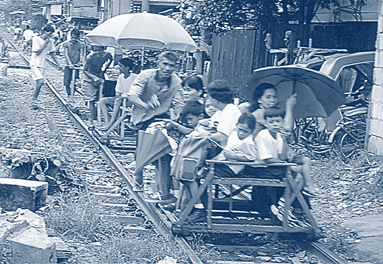 Filipinos have a long tradition of devising low-cost yet effective ways of moving around cities and the countryside. After the Second World War, enterprising young men began converting surplus US army jeeps into jeepneys that carry between 15 and 25 passengers. Manila’s colorful and ornately decorated jeepneys are today the workhorses of the city’s transportation system, carrying some 35 percent of passenger trips. Jeepneys are popular because they are cheap, operate virtually all the time, and stop and pick up anywhere. Their intermediate sizes are an advantage as well: compared to buses, they can more easily navigate Manila’s crowded streets. Manila’s jeepneys provide mainline services, plying main thoroughfares and competing head-to-head with government-subsidized light-rail services. In recent years, they have faced stiff competition from Tamaraw (Toyota) FX vans—air-conditioned, comfortable ten-seaters that appeal to the professional class. 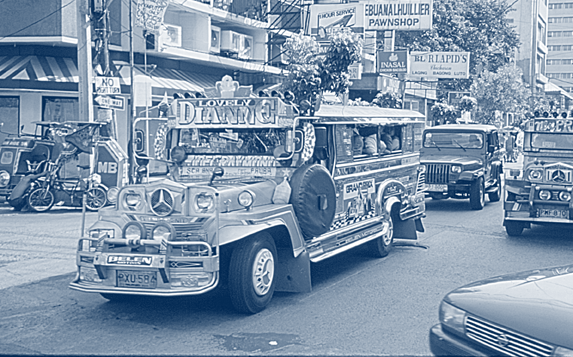 Complementing jeepneys and vans are Manila’s secondary net of carriers—privately owned and operated taxis, pedicabs (both human-powered and motorized), and horse-drawn carriages (calesas). These modes function as feeders to mainline services. Also notable are several one-of-a-kind, indigenous forms of entrepreneurial transit. Go to the railroad tracks in some of Manila’s poorest neighborhoods today and you will find several hundred young men pushing bamboo trolleys fitted with roller skates that glide along the rails, providing lifts to school kids, matrons with groceries, and businessmen in suits and ties (who are known to exit taxis and board the “skates” to get around traffic tie-ups). In the Philippine countryside, hundreds of industrious farmers have attached passenger carts to the hand tractors they use to harvest crops, creating a unique farm-to-market mode, the kuliglig . 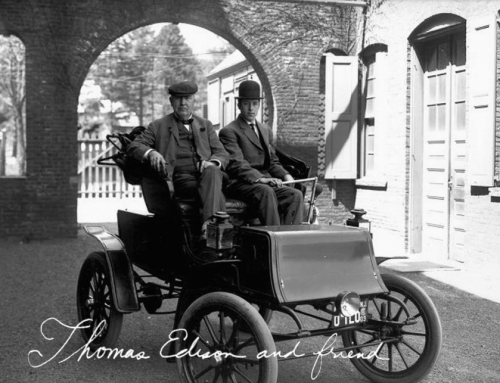 My point, of course, is not to suggest we emulate such homespun technologies, but rather to highlight the astounding efficiencies and inventiveness that can be unleashed in an open, free-ranging transportation marketplace. A core distinction of entrepreneurial transit is whether it is “taxi-like,” providing door-to-door connections, or “bus-like,” following more or less fixed routes (see table). 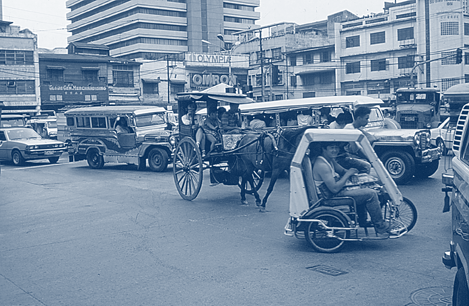 In general, small-vehicle services, like pedicabs, motorcycle taxis, and microbuses, operate akin to taxis (but at a fraction of the fare). 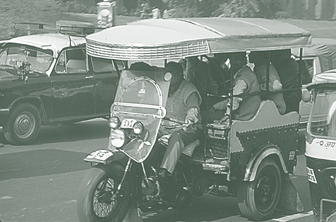 Included here are Bangkok’s tuk-tuks, Jakarta’s bajajs , and the motorcycle taxis of Nigeria (okada), Dominican Republic (moto-conchos), and Cambodia (moto-dub). Taxi-like carriers function mainly as feeders. With larger passenger loads, service providers ply fixed routes because of limitations on delivering lots of unrelated customers to assorted destinations. Thus, the vehicles of choice for bus-like services are station wagons (Buenos Aires’s remises), vans (Salvador’s kombis), pick-up trucks (Managua’s camionetas ), and minibuses (Hong Kong’s Public Light Buses). I don’t mean to give the impression that entrepreneurial transit is universally of low quality. In Kingston, Jamaica, private entrepreneurs have begun operating express, premium minibus services, complete with morning coffee, pastries, and newspapers. These services have been hugely successful, but would never have been mounted by Kingston’s cash-strapped public bus operators. Of course, informal transportation services are not problem-free. As free-reign services in cities with high unemployment, they can breed over-zealous competition and predatory behavior. Over-competition gums up busy streets and poses accident risks. Accordingly, critics argue that private carriers should be heavily regulated, if not banned outright. Third-world cities with many informal carriers are congested, and the surfeit of vehicles makes for chaotic and collectively damaging operating practices—drivers cut each other off, stop in middle lanes to load customers, and weave erratically across lanes. 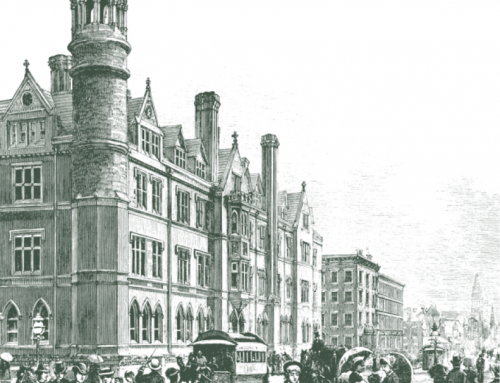 The worst problems occur around busy marketplaces and bus terminals. In Kingston, Jamaica, illegal operators called “robots” (most driving station wagons) have been known to kick everyone off their vehicles, turn around, and head in the other direction when more money can be made going the other way. In Rio de Janeiro, illegal van operators hire touts to hang around bus terminals and coax waiting customers to hop aboard nearby vans. Unregulated transportation also generates safety and pollution problems. Hyper-competition and its by-products—fatigued drivers, vehicle overloading, roadway violations, under-inflated and bald tires, etc.—increase accident rates. Overcrowding invites pickpocketing and bullying, epidemic problems on jitneys and microbuses in parts of central America. 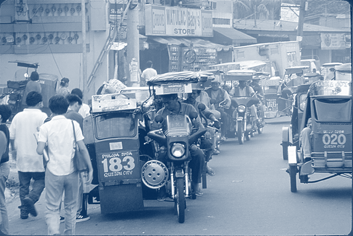 Minibuses, motorized pedicabs, and for-hire station wagons are also gross polluters owing to their aging vehicles with under-tuned engines, frequent acceleration and deceleration in congested traffic, and diesel and low-stroke engines. Delhi’s vast population of 1.8 million two-wheel motorcycles and 80,000 two-stroke auto-rick-shaws emit more hydrocarbons and carbon monoxide per kilometer than even fully loaded buses. It’s easy to argue that such “externalities” are good reasons for banning entrepreneurial transit in first-world cities. In truth, such problems exist because most third-world countries are too poor to invest the resources needed to license and monitor private carriers and to enact and enforce regulations governing driving practices and vehicle fitness. Given our long and substantial experience with common-carrier regulation, this would not be a problem in the United States. We should distinguish between regulating for public safety and welfare versus regulating to set service standards and prices. The need for the former is unassailable—especially because small carriers are physically more vulnerable, thus more likely to lose out in a collision. The need for the latter is questionable. Experiences show the marketplace can better regulate service levels and prices than can bureaucrats. 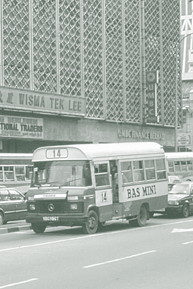 Moreover, reputed problems of informal transport are sometimes a smoke screen for class-based reasons for wanting to ban jitneys and microbuses. They typically include pressure from foreign vendors seeking to export modern transport technologies to developing regions; a mind-set among public officials that pedicabs and jitneys tarnish their image as modern states; and a cultural predisposition among foreign transportation consultants to focus on expediting traffic flows without an inkling of the vital roles microvehicles play in providing mobility for poor passengers and jobs for poor drivers. Transit entrepreneurs are keenly aware that ruthless competition is collectively damaging and that survival depends on some degree of self-policing and self-restraint. In contrast to the hierarchical structures of regional transit authorities, entrepreneurial transit is held together by grass-roots alliances of drivers, brokers, parts suppliers, creditors, and sometimes “parasites” (e.g., street hustlers and corrupt local officials who routinely demand bribes). Route associations are the glue that holds the entrepreneurial transit sector together. They exist to bring order to an environment that breeds cutthroat competition and anarchy in the streets. They set the ground rules and seek a reasonable balance between supply and demand, minimal duplication of routing and scheduling, orderly customer boarding and alighting, and some level of civility and good citizenship among members. Some associations even run their own traffic courts, where alleged interlopers or customer poachers go before their own peers and, if found guilty, must pay the consequences. In middle-income countries, associations provide other services, such as access to credit, group discounts on insurance and fuel, and (by hiring “plants”) radio-relayed information on how best to avoid police stake-outs and traffic jams. In Rio de Janeiro, associations of informal van operators publish newsletters and stage events for the press in an all-out campaign to show the “clandestine van” industry in a positive light. 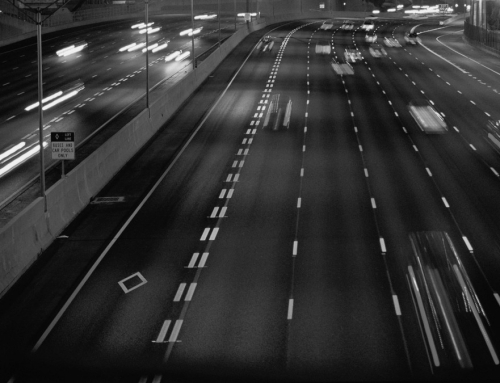 Over time, some route associations may evolve into price-fixing cartels. That happened in Santiago following deregulation in the 1980s. Oligopolies are just as harmful in the urban transportation sector as they are in the airline industry. However this does not mean it’s necessary to clamp down so hard as to regulate transit entrepreneurs out of existence. Rather governments should exercise restraint and good judgment, restricting oversight mainly to matters of promoting safety and fair competition, and leaving matters of supply, service, and price principally to the marketplace. In technical fields like transportation, we often think knowledge transfer runs from the first world to the third world. The experiences with entrepreneurial transit suggest that the poorer parts of the world have at least four lessons to offer the rest of us. 1. Competition is, on balance, healthy. The inherent flexibility and profit motivations of entrepreneurial services mean they are acutely market-responsive. Transit entrepreneurs are more likely than public authorities to craft new, tailor-made services in response to trends like increased suburb-to-suburb commuting, trip-chaining, and off-peak travel. As a result, many entrepreneurial services are today oversubscribed, with customers queuing for rides at off-street terminuses. Surveys in India reveal many people opting for cycle rickshaws because, compared to public buses, they are more affordable and more reliable. Surveys of clandestino customers in Brazil reveal that their preferences for vans over conventional buses are because of speed advantages (cited by 44 percent of respondents) and comfort levels (25 percent). Stepped-up competition no doubt hurts public bus operators in their bank accounts. In Rio de Janeiro, surveys found that 65 percent of van customers previously commuted by public buses. To blame entrepreneurial transit for these losses is unfair; such outcomes reflect the unwillingness of protected bus franchisees to downsize and change their business-as-usual habits. 2. Regulations should be relaxed. Heavy-handed regulation makes sense only where natural monopoly conditions exist (or where public policies call for cross-subsidization of services). Increasingly the urban transportation sector needs economies of scope—that is, an array of transit service and price options—which entrepreneurs can best provide, rather than economies of scale, which often exist only on mainline corridors that can support subways and busways. In coping with entrepreneurial transit, public authorities must decide upon an appropriate level of intervention. In most cases, this should entail a policy of recognition, rather than regulation. The main difference is that recognition allows the marketplace to mediate supply levels and prices; under regulation, market entry is externally controlled. Recognition involves the issuance and enforcement of rules and standards, mainly concerning areas of operations, safety, vehicle specifications, and labor practices. All carriers who meet minimum standards are then free to start and run a business. The aim is to make sure vans, minibuses, and microvehicles act as complementary carriers. Where they are allowed to compete directly with formal bus and train services, the aim is to assure that they do so fairly. As long as a reasonably fair and contestable marketplace can be maintained, governments should generally stay clear of matters related to service design, pricing, and hours of operation. We already know what happens when local US officials deregulate paratransit by turning their heads the other way. The unlicensed vans that swarm around major bus terminals in the Jamaica section of Queens, New York, provide door-to-door, guaranteed-seat services at a profit. They have much in common with their counterparts in the Caribbean—indeed, many drivers plied the streets of Kingston and Montego Bay at an earlier time in their lives. While I am not suggesting that New York and other cities discard rules governing driver licensing, curbside behavior, and vehicle fitness, I am suggesting that relaxed restrictions on market entry would enhance mobility options by filling the huge chasm between conventional fixed-route buses and exclusive-ride taxis. 3. Market distortions should be reduced. Heavy subsidies to public transit systems—monies that studies show often go to fatten workers’ and administrators’ paychecks without commensurate improvements in service— continue to suppress America’s paratransit industry. We need to move away from “provider-side” subsidies and toward “user-side” subsidies that go directly to the intended beneficiaries— the transportation-needy. With transportation vouchers in hand, travelers could decide whether a traditional bus, a jitney, or a taxi-like microvehicle best serves their particular travel needs. Governments should not be watchdogs only. They can also help empower entrepreneurial transit. For example, capital grants could go toward providing off-street terminals and staging zones. A good example is the multi-story terminals built to house private jitneys and vans in San Juan, Puerto Rico, funded by the US Federal Transit Administration. On-street provisions, like dedicated high-occupancy vehicle lanes, would likewise aid paratransit. Government might also pilot-test ideas like “curb rights” to ration scarce curbside space along crowded streets. Intelligent transportation systems might also have a place in the paratransit sector. Two-way pagers are today widely used by Bangkok’s van associations for communicating between terminal managers, dispatchers, and drivers. Many South African kombivan associations have introduced stored-value debit cards as a means of not only streamlining fare transactions but also as a hedge against theft and assaults. Surely there is as much latent capacity for innovation in America’s transit sector as there is in the third world. There experience shows that a more open marketplace enriches mobility options. Here, onerous regulations and heavy-handed oversight have squelched competition. High standards—e.g., insistence that there be brand-new taxis, limits on where customers can be picked up, curfews on when services operate—continue to stand in the way of entrepreneurial transit in America. There is tremendous diversity in today’s urban transportation marketplace. Some want fast, comfortable services and are willing to pay premium fares for them. Others are satisfied to travel more slowly and give up some comfort in return for a break at the farebox. Entrepreneurial transit stands the best chance of enriching urban transportation offerings in America today. If we could tone down regulations and invite open competition, we might one day find as much choice and variety in our urban transportation sector as is presently found in much of the developing world. 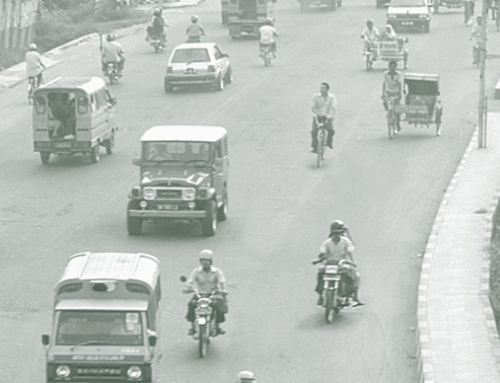 This paper was drawn from a recent publication, Informal Transport in the Developing World, prepared for the United Nations Commission on Human Settlements (Habitat). Robert Cervero, Paratransit in America: Redefining Mass Transportation (Westport: Praeger, 1997). Robert Cervero, Informal Transport in the Developing World (Nairobi: United Nations Commission on Human Settlements, 2001). Daniel B. Klein, Adrian T. Moore, Binyam Reja, Curb Rights: A Foundation for Free Enterprise in Urban Transit (Washington, D.C.: Brookings Institution Press, 1997). Gabriel Roth and George Wynne, Learning from Abroad: Free Enterprise Urban Transportation (New Brunswick, New Jersey: Transaction Books, 1982). Isaac Takyi, “An Evaluation of Jitney Systems in Developing Countries,” Transportation Planning and Technology, v. 44, no. 1, pp. 163-177, 1990. 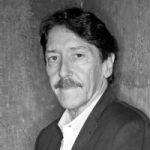 Melvin M. Webber, “The Marriage of Autos & Transit: How to Make Transit Popular Again,” ACCESS, no. 5, 1994.